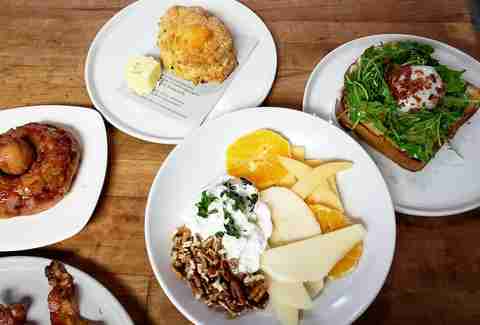 Only a few years ago, brunch options in San Antonio were limited to overpriced hotel extravaganzas, barbacoa at neighborhood tortillerias, breakfast taco hangouts, or a handful of old standbys. 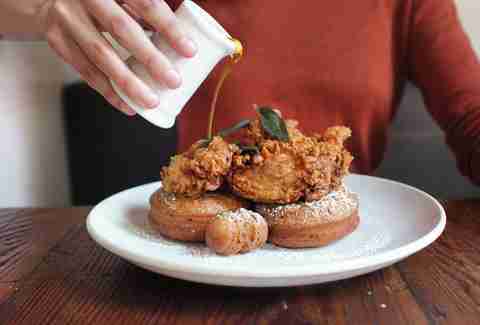 Fortunately for brunch lovers, the times have changed: weekends are now replete with choices for a boozy morning/afternoon meal, with dishes ranging from the traditional (chicken and waffles) to the extravagant (ricotta funnel cake). Gather a group of your favorite people and enjoy a leisurely meal with a cocktail -- or three -- at San Antonio’s best brunch spots. Just when you think you've had your fill of chicken-and-waffle variations, the inspired tinkerers at Barbaro come up with chicken and zeppole, topped with shaved parmesan and butterscotch. It’s brilliant, and an instant classic at this unassuming spot tucked just a couple of miles north of Downtown. 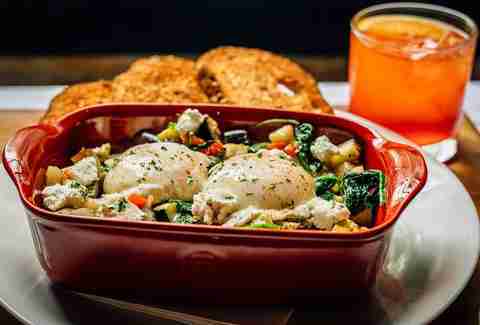 The Eggs Barbaro tinker with a different brunch staple by topping house-made focaccia with poached eggs, roasted tomatoes, spinach and basil-garlic puree. Come on a Saturday or Sunday morning and pair these thoughtful offerings -- or one of their very good pizzas -- with an expertly made cocktail. 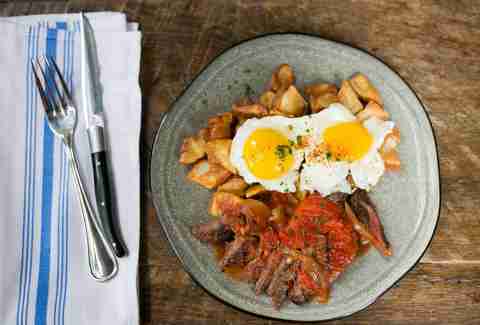 An array of savory dishes set the pace at this former fire station that’s now one of the city’s hottest dining destinations, where reservations are strongly recommended even for Sunday brunch. Braised beef cheeks topped with a spicy fra diavolo sauce, and a salad of fresh tomatoes, thinly sliced red chiles and thinly sliced red onions atop flour tortillas transport the San Antonio favorite of barbacoa de cabeza into new territory. Looking to get your sweet on? Nutella toast gets a the grown-up treatment to include puffed rice, olive oil and just a touch of coarse sea salt. Meanwhile, ricotta funnel cake, tiramisu French toast, or piled high buttermilk pancakes will satisfy cravings you never knew you had. You can certainly get a mimosa, but consider something boozier, too. This restaurant celebrates the Asian influences of Peru’s complex and delicious cuisine, so the Sunday brunch potstickers always satisfy. 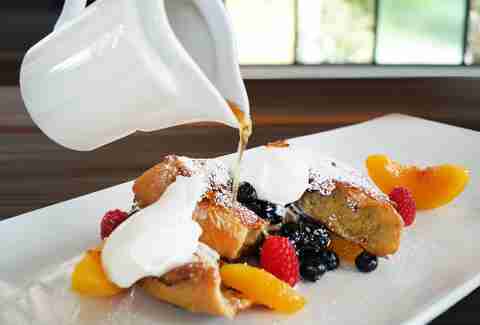 If you like French toast, you’ll crave the not-too-sweet Latin American-style French toast with sauteed sweet plantain, dulce de leche and whipped cream called torrejas. Enjoy a Peruvian inspiration with the Botika Benedict that brings roasted sweet potato, pork belly and chicharrones, with poached eggs and hollandaise spiked by the gentle spice of aji amarillo. Or, go full Peruvian with the cebiche of the day in the tart marinating liquid, the leche de tigre -- that translates to “tiger’s milk,” and it’s renowned as a hangover cure (or aphrodisiac). Just gonna leave that there. With constantly changing brunch specials (rocky road pancakes with bacon and eggs, and roast duck are two recent examples) sharing the menu seven different types of Eggs Benedict and three different kinds of omelettes, there’s something for adventurous diners and those who pick a favorite dish and stick to it. When the weather permits, the adjacent patio offers delightful outdoor dining. Either way, consider living large and ordering the surf and turf with beef tenderloin, lobster tail, asparagus and béarnaise -- as though you were really going to be productive after brunch anyway. Forget the traditional Bloody Mary during this Saturday-only brunch and go for Cured’s version, the Mountain Mary, featuring moonshine in place of vodka and a garnish of pickled okra that rivals the cocktail in flavor. Take the house suggestion and get The Chef’s Breakfast of biscuits, crabmeat, eggs, boudin noir, praline bacon, fried green tomatoes and a michelada made with Miller High Life. If you’re visiting this temple of charcuterie, though, you really owe it to yourself to sample some of the current offerings. 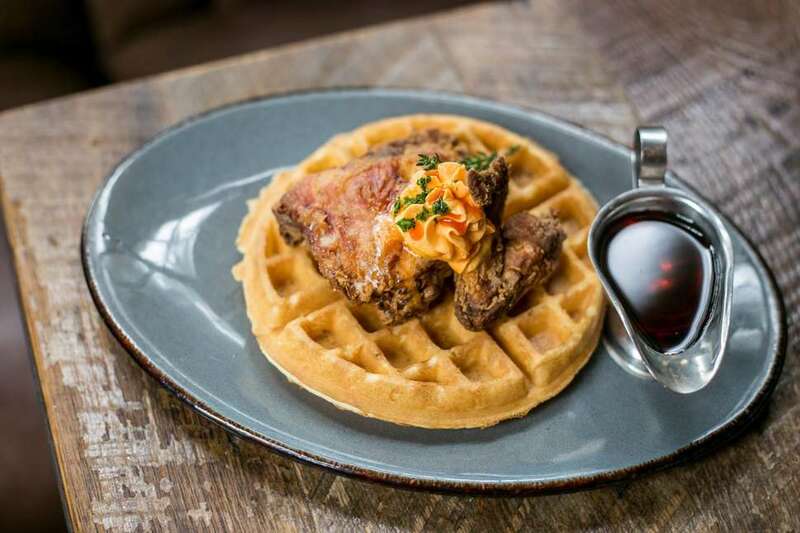 With a fried green tomato Benedict, shrimp and grits, chicken and waffles, and an exceptional biscuits/gravy combo, this might seem like a very Southern place indeed. 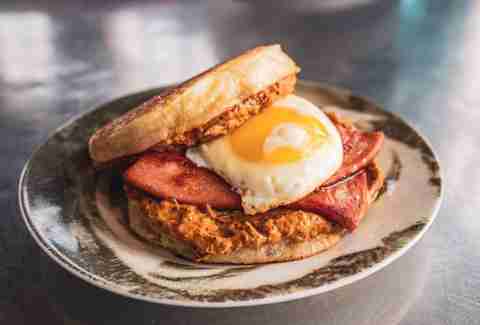 Then you notice the pimento cheese fondue offers a jalapeño kick, and pork belly hash features an expertly roasted salsa, and of course the menu includes a very good rendition of huevos rancheros. The rustic exterior belies a sleek, industrial interior, with hardwood floors and plenty of natural light that serves as an appropriately blank canvas for such a parade of flavors. If you’re looking to calibrate your palate for the way a classic eggs Benedict should be made, this is the place. At the weekend brunch, the Benedict features Smithfield Ham, while a delightful house-cured salmon includes a properly baked house-made bagel, and even a French classic like the frisee salad hits all the right notes. 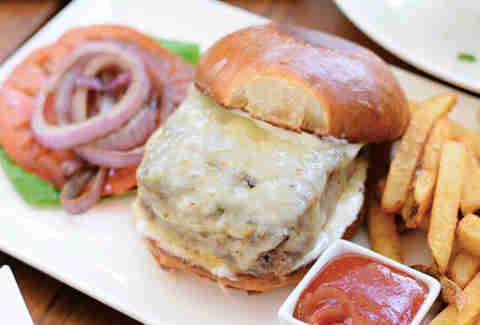 Pair any of the brunch items with a well-balanced cocktail or get a wine recommendation and find just the right match -- or skip brunch altogether and get an order of steak frites, or the juicy and craveable Maverick Burger. Yes, there are biscuits and gravy here, but this menu offers a thoughtful approach to Southern cooking that transcends the classics. Heirloom grits are topped with braised pork belly, poached egg and a charred onion for a sensation that’s both rustic and elegant; ask about the seasonal breakfast pizza from the wood burning oven. Mimosas are fine, but you'll want to forego the traditional for something a bit more outside-the-box: like a cereal milk cocktail, say. Pastel walls, hardwood floors pair with the wood and metal shelves to provide a comfortable-yet-modern setting for your repast. Beignets, chicory coffee, French toast -- check, check, and check... but don’t stop there. You have to try the rich blue crab omelette with creole hollandaise, cajun-spiced crab cakes, shrimp and grits and a delightfully decadent slice of praline bacon. This renovated former bungalow just off the St. Mary’s Strip gets its Crescent City flavors right, and keeps them coming six days a week. Although the former BYOB policy is no more, the menu's stocked with classics like mimosas and frosé, and you can still bring a bottle of your own stuff if you're fine paying the $10 corkage fee. This crowd-pleasing favorite is seemingly always packed for lunch and dinner, and offers a weekend brunch full of regional Mexican specialties, such as molletes (baguette-shaped bread sliced and topped with refried black beans and white cheese) and interior Mexico-style chilaquiles, which are simply strips of corn tortillas fried with salsa verde and topped with diced onions, queso fresco and sour cream. 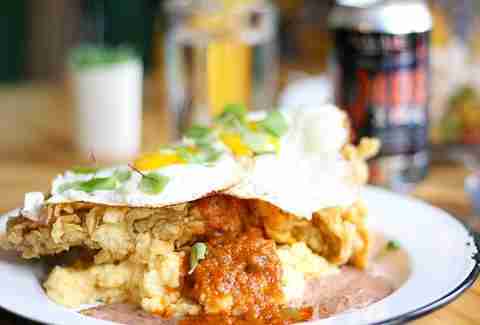 They also offer the north-of-the-border style chilaquiles, where the corn tortilla strips come with scrambled eggs and salsa, or keep it classic with some huevos rancheros. Margarita or mimosa -- why not both? 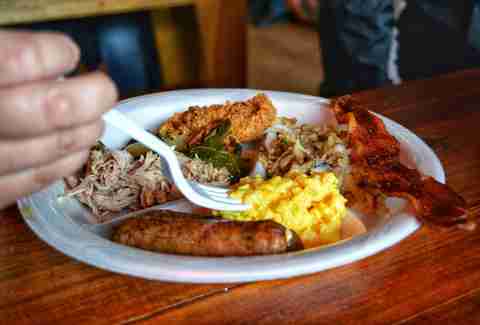 This sibling to the Smoke Shack offers a Sunday Southern buffet that'll serve as the highlight of any weekend, with housemade biscuits, brisket, pulled pork, pancakes, grits, fried catfish, fried chicken, mac and cheese, collard greens, and a lot more. There’s indoor seating, but everything tastes better at one of the outdoor picnic tables, and at $16 per adult, it’s a surprisingly reasonable splurge for such great flavors. Take advantage of that price point by snagging a Bloody Mary garnished a slice of Smoke Shack brisket. Now with an outdoor oyster bar, Southerleigh has grown into the epicenter of the Pearl district, attracting fashionable guests from all over. Enjoy a weekend brunch Benedict paired with cornbread, braised country ham, and Crystal hot sauce hollandaise, or dive into a sandwich of fried chicken topped with bacon and an egg. Whether you’re sitting inside or outdoors, the fresh, chilled seafood selections are worth trying, and you’d be surprised how well caviar pairs with Zapp’s potato chips. This spot has gained a large following for its brewing operation and constantly rotating beer selection as well -- ask your server for a pairing recommendation, or better yet, just get a flight. Signature’s Sunday brunch serves as a great introduction the menu and polished service of this restaurant on the grounds of the La Cantera Resort & Spa. Start with the Bloody Mary service, which includes an oversized tray of garnishes to choose from, and consider moving on to what might be the greatest burger in the city: the Breakfast Burger, with a topping of fancy hash browns called potato rösti, roasted tomato, bacon, and a fried egg. The French-style omelettes are perfect in their presentation, and the blueberry buttermilk pancakes feel refined. Even though you’re across the street from a major shopping center, the rustic elegance of the building and grounds give the feeling of a getaway.